Flying from Terminal 2 or 3 at Heathrow Airport? Heathrow Maple Parking Meet and Greet offers a convenient and stress-free parking service that’s perfect for all travellers. You’ll be met just a short walk from the terminal, from where you’ll be able to head to the check-in desks while your car’s parked in a nearby car park. 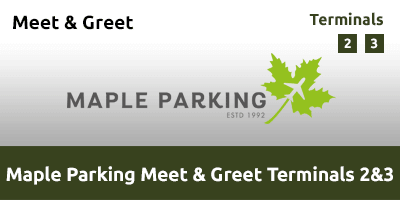 Whether you’re weighed down with bulky luggage, running to a tight schedule or travelling with small children, Maple Parking Meet and Greet is ideal for ensuring your holiday starts in style. No transfers required with this convenient service – you’re just a short walk from the check-in desks. This is the ideal parking solution customers who may require any extra assistance. Maple Parking will not be able to take your car if it is not legal or is in any other way unsafe to drive, such as tyre tread not within the legal limit. Follow directions to Heathrow Airport. Pick-up signs for your departure terminal. Pass through the tunnels (Tunnel Road) and follow the arrival instructions below. Terminal 2 - ( TW6 1EW). After passing through the tunnels (Tunnel road) into Heathrow Airport, follow signs for Terminal 2 Short Stay Car Park. Take the right hand lane and pass under the 2.2M height restriction, follow signs for ‘Level 4’ and ‘Off Airport', keep right and take a ticket from the furthest right-hand Ticket Barrier (please hand this to our Handover Captain). Drive straight forward following signs for ‘Off Airport Parking’. Park in one of the ‘Off Airport Meet & Greet’ parking bays in rows A or B.
Terminal 3 - (TW6 1QG) After passing through the tunnels (Tunnel road) into Heathrow Airport, follow signs for Terminal 3 Short Stay Car Park At the entrance barrier, take a ticket (please hand this to our Handover Captain ) Drive up to level 4. Park in one of the ‘Off Airport Meet & Greet’ parking bays.